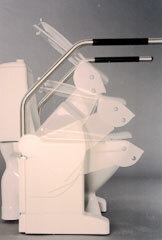 The Aerolet toilet lift is a toilet seat riser that provides you with optimum support for the natural motion of standing up. The stable seat position allows constant contact with the floor. The user requires at least 25% of muscular strength. The Aerolet has easy to use electronic controls and can be used in conjunction with electronic bidets for fast and easy installation. The Aerolet load capacity is up to 150kg, with a seat height from 390mm to 520mm. 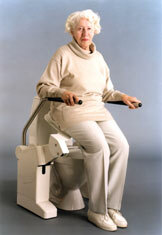 The Aerolet toilet lift from Economic Holland B.V. is an ergonomic toilet-aid designed to facilitate independent toilet use for anyone with a reminder capacity of 25% of muscular strength. 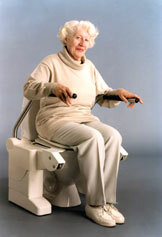 An important advantage of the Aerolet toilet lift is the adaptability to the user. 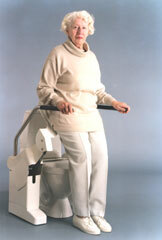 The Aerolet toilet lift is adjustable to leg length and the level of trunk-stability. the knee and hip joint stretch synchronously.